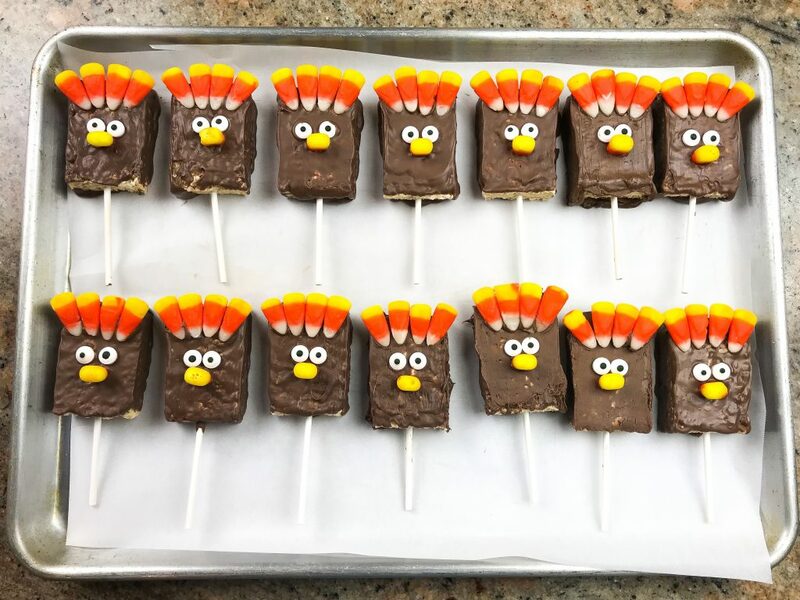 These are a quick and simple treat that are perfect for your upcoming school parties, bake sales and family gatherings . 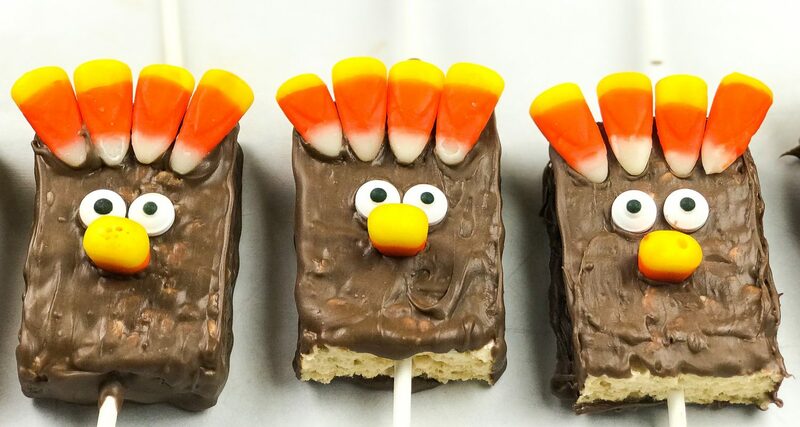 I mean who would turn down an adorable turkey on a stick? Let’s get started! Red Chocolate Candy Melts – We found the mini drizzle pack but they aren’t available many places. You can get the full bag of Red and save the rest for a future project! 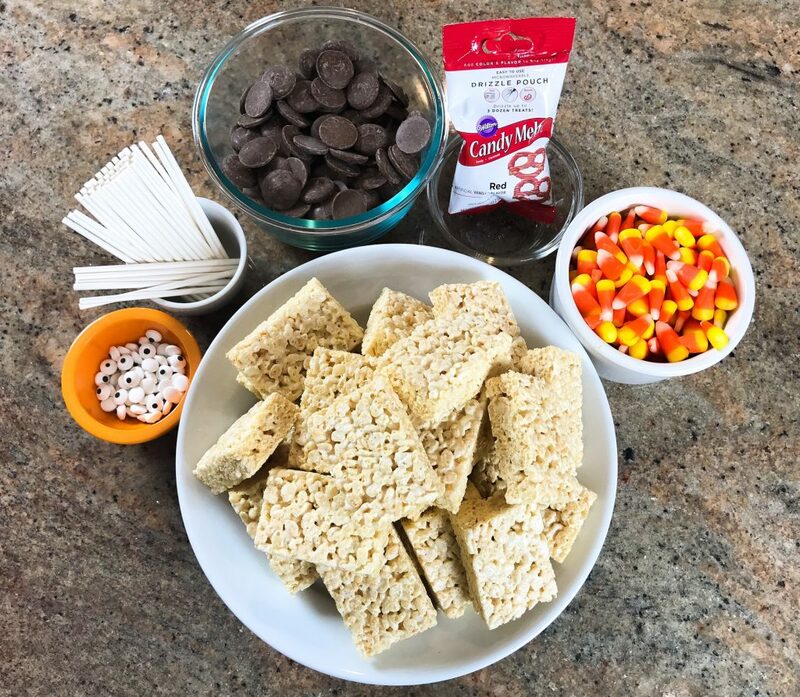 Unwrap all of your little Rice Krispie treats … OR for those of you that made your own, once the Rice Krispies have hardened, cut them into rectangles that are approximately 2″x3”. 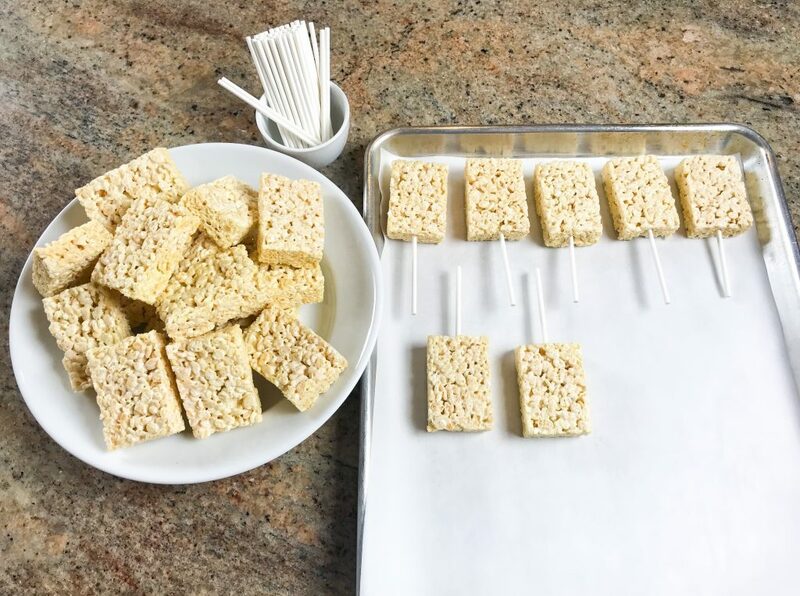 Put each of your Rice Krispies on a lollipop stick and put them aside. 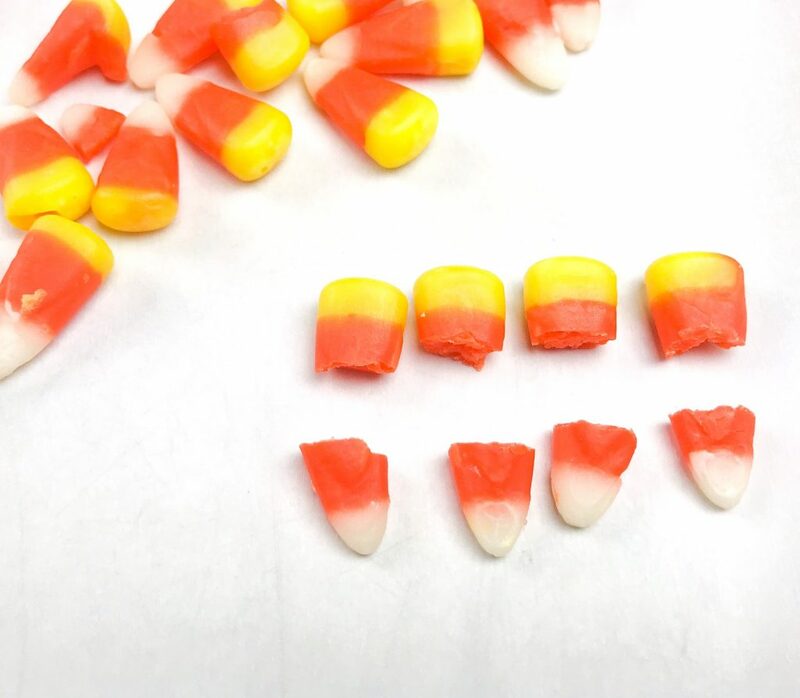 Cut some of the candy corn in half. We used the bottom half with the yellow to create the turkeys’ beaks. Place all of the cut halves that you’ll be using in a small bowl and discard the other halves. Set them aside. Add your candy melts to a shallow microwave safe bowl and heat according to package directions. Keep in mind that whey you dip the Rice Krispie in the chocolate you need to be able to have room to move it around to each side with the stick attached. You might even want to pour some of the melted chocolate onto a plate to more easily coat them. 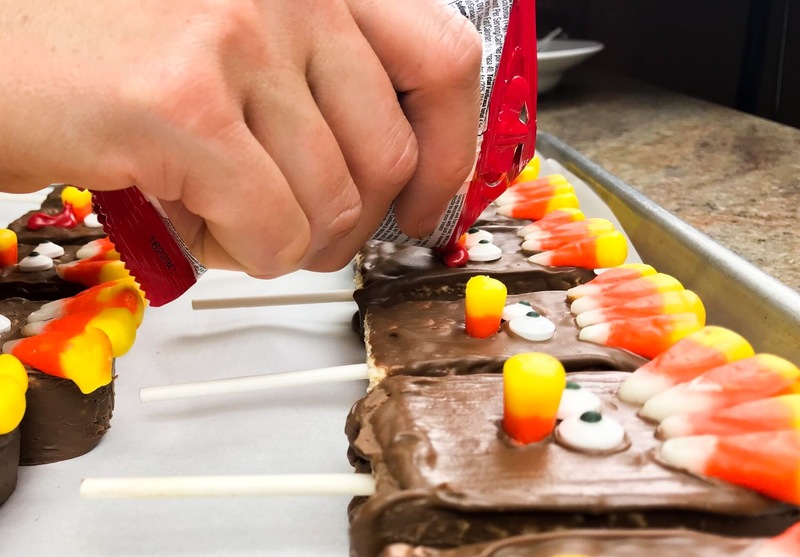 Work quickly dipping the Rice Krispies in chocolate then adding the candy corn for the tail, candy eyes and cut piece of candy corn for the beak. Then move onto the next Rice Krispie. 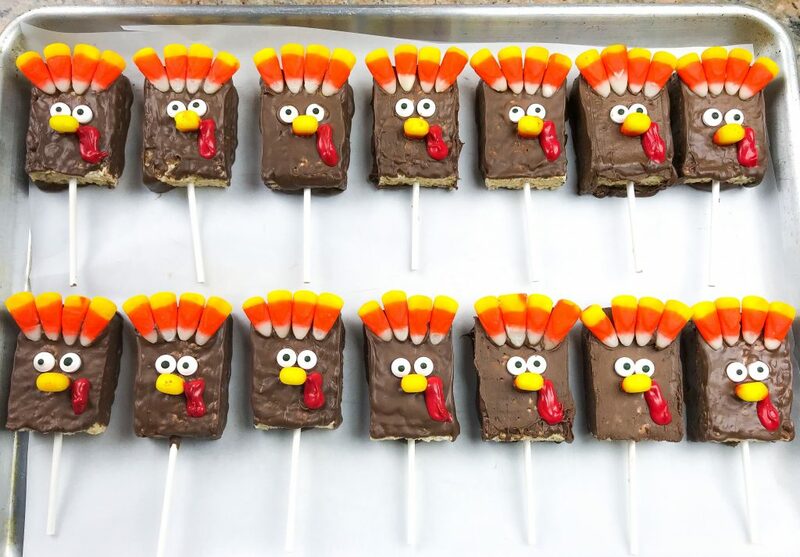 If you can inlist a helper or two it goes a lot faster especially if there is one person dipping and smooting out the chocolate and one doing all of the “dressing” HA that’s turkey humor. If your dipping chocolate starts to harden, warm it up again in the microwave to make it smooth again. We had to do this at least once. Now it’s time to add the wattle or the snood or whatever it’s called – the little red thingamajigger is the technical term i believe. If you have the little red drizzle pack, heat it according to package directions and cut a small slit at the top of the bag. If you have a larger bag of candy melts, heat up about a 1/4 cup according to package directions and pour them into an icing bag or a ziplock bag. Cut off the tip of the corner of the bag. Draw the little red thingamajigger next to his beak. Go back with an extra lollipop stick or a butter knife to smooth it out or change the shape of the thingamajigger. Put the tray in the fridge for about 10-15 mintues or until the chocolate has hardened. 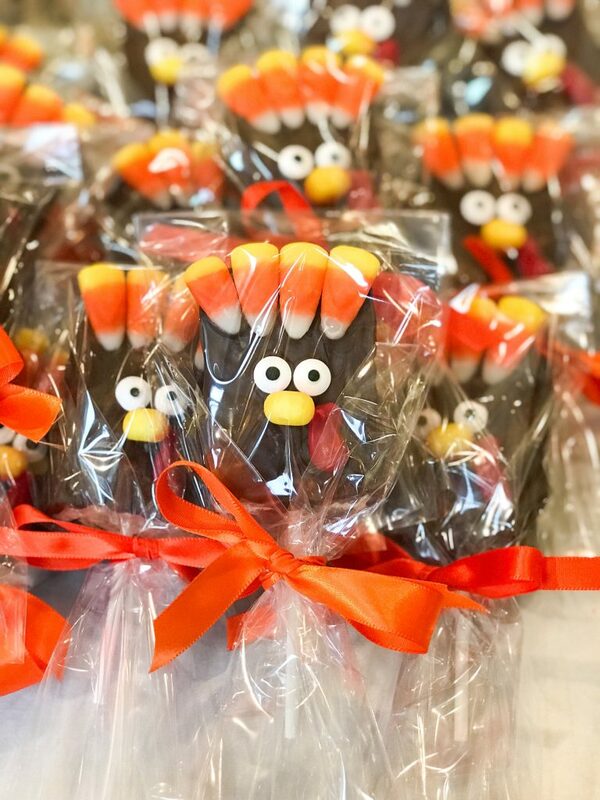 Once the chocolate has hardened, put each individual turkey pop in a treat bag and tie it shut with some ribbon.